I enjoyed playing Gwent with the foul-mouthed locals of The Witcher 3 enough to give the standalone version some of my time. It captures the charm and strategic complexity of the original card game but has updated visuals and card effects that help it to better fit among its competitors in the CCG genre. But there is one thing that troubles me – Gwent has terrible loot boxes. Here are the best Gwent decks for each faction. I acknowledge that this is an unusual opinion to have. Microtransactions are a sore topic for many, with loot boxes being one of the most maligned iterations as they encourage repeat spending due to the contents of each box being determined by chance. So far, however, Gwent has been reasonably generous. Card packs, or Kegs, as they are known in-game, are given out every other time you level up, and the game’s in-game currency, Ore, is offered as a reward for winning rounds, meaning you don’t even have to win games to earn new cards. So it is not that CD Projekt Red are being stingy with their loot boxes – the problem is I don’t like opening them. Allow me to explain. 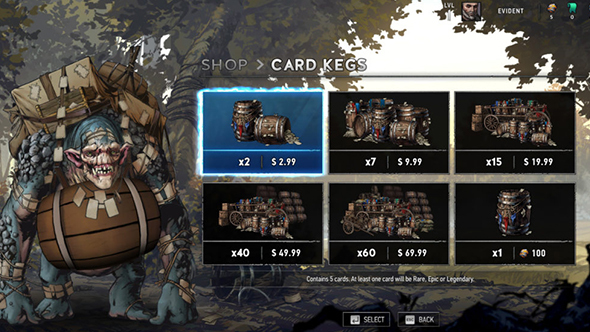 In Gwent, you open Kegs by visiting the shop. While in Hearthstone the shop maintains the same visual style as the rest of the game, Gwent’s shop transforms the game, opting for a 2D cartoon style and a different UI. It sounds like a small thing, but this transition is jarring, taking you out of the game – and out of a world that feels like that of The Witcher – for no discernible reason. Once in the shop, you are greeted by Shoop, a Troll who sells you Kegs and chatters inanely. His comments range from simple sentences, such as “Customer right always,” to vague sound effects applied at seemingly random moments. A pleasant enough chap, sure, but his efforts to make small talk wear thin quickly – especially given how long it takes to open even a couple of Kegs. This irritation is exacerbated by the way you uncover your cards. Now, in Hearthstone, cards fly out of their packs with a flash of light, a crackle of energy, and a clash of cymbals. Even the most basic cards turn over with some panache, while rarer cards glow according to their value as you mouse over them, the inkeeper issuing forth a triumphant shout as you flip them. It feels great to open a pack and even better if you get a good card. In Gwent, instead of an exciting flare, Kegs open with a painful, blinding flash. The cymbals are replaced with the jarring sound of splintering wood and Shoop mumbling inanely to himself in the background. The particle effects are minimal, and cards simply twist around during the reveal with barely any fanfare at all. It all combines to create an effect that is more unpleasant than celebratory. To make matters worse, Shoop will chime in if you get a card that is rare or higher from your first four cards, but sometimes he will also make some noise of vague approval on low-level common cards. Not only does this cheapen the experience when you actually get something good, it becomes irritating very quickly – I can tell when a card is not good, I don’t need to be patronised about it to help soften the blow. 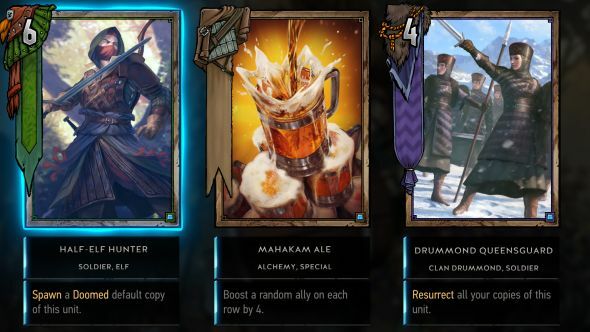 After you have opened your first four cards in Gwent, you are offered the chance to pick one of three bonus cards, all of which are guaranteed to be rare or above. Rather than opt for any suspense, however, these cards simply scroll onto the screen, fully revealed, rather undermining the suspense of unlocking them. We are programmed to enjoy unexpected pleasures with a hit of dopamine when happening across a pleasant surprise. 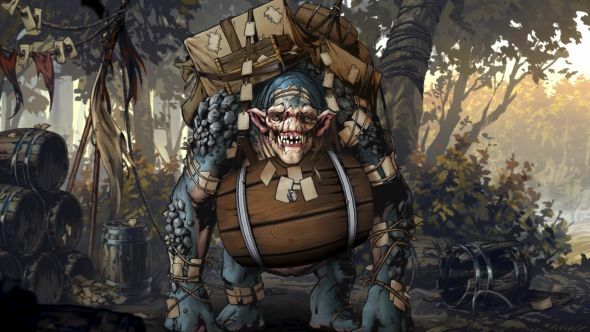 CDPR have set up their loot boxes to make the most of this but have – either deliberately or by accident – reduced the effect with their shop design. Not only does it make me enjoy the process of getting a rare card less (especially since I have to turn away two others) but it also discourages me from buying more Kegs with real money – which, typically, is what loot boxes are meant to do. Sure, the whole process finishes with another flash, and an angelic choral chant that can be recognised from The Witcher 3, but the damage is done by that point, and I want to get as far away from Shoop as possible. I am not suggesting that companies should be better at manipulating me into spending more of my money. And CD Projekt Red should be acknowledged for making a CCG that is willing to give so much away for free. But the problem lies in the fact that this is a card game, and across its lineage from Magic the Gathering to the digital rebirth of the genre, collecting cards has been, and still is, crucial. The practice drives not only the financial viability of a given game, but also the state of its meta – which, cyclically, impacts the money coming in. Gwent is high-profile enough that it is in little danger of failing, but that is not an excuse for missing the opportunity to make an experience so central to the health of the game as satisfying as possible.